Since the release of iOS 11 and the iPad Pro, Apple has been asking “what’s a computer?” And, now that Adobe is bringing Photoshop over to to the iPad as well, many more people might be asking themselves that same question. We don’t know when it’s going to happen, but Adobe is planning on bringing Photoshop to iOS later this year, as part of the process of porting more Creative Cloud apps to the mobile platform, according to a report from Bloomberg. The full details of the app will be unveiled at the MAX creative conference in October, according to people close to the plan. 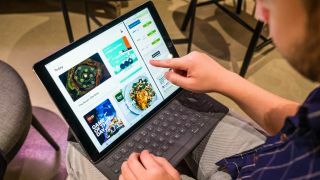 We don’t know what the compatibility will be like, however Belsky did mention that “Newer versions of the iPad Pro are now powerful enough to support Adobe’s apps”. So, perhaps it’ll require an iPad Pro to work – and maybe the 2018 student iPad as well. Apple has previously been rumored to be unveiling new iPad Pro 2018 tablets. This shift in strategy is due to hobbyists demanding the ability to make edits to their creative projects ‘on the fly’ according to Scott Belsky, Adobe’s chief product officer of Creative Cloud. He’s aiming to get Photoshop, along with other Adobe products “on the market as soon as possible”. An iPad version of Illustrator is apparently also on its way, but it will come along later than Photoshop for iPad. Adobe’s mission here serves two purposes, then: to cater to professionals on mobile platforms, and to win over casual users, who may never have even tried a full-fledged photo editor like Photoshop. While Apple has generally been at center stage when it came to creative-focused applications, the Microsoft Surface Pro, thanks to its native Windows 10 support, has recently become the go-to device for creatives on the go. However, now that Photoshop and other Creative Cloud programs are coming to the iPad, it could put a dent in the Surface Pro’s market share – especially since even the iPad Pro is much less expensive and it’s always improving with iOS 12 and yearly updates. This wouldn’t be the first time that Adobe has toyed at iOS. Recently, Adobe previewed Project Rush, now in beta, which is a video editing app that works across all platforms. Rush is a “test bed” for this new platform, according to someone familiar with the Adobe software program. This news that Photoshop will be coming to iOS seems to suggest it was a successful test, after all – even if it’s still in beta.